At the end of our guiding tour through our kennel 'von Schlesien', we would like to give you some information concerning the merle. 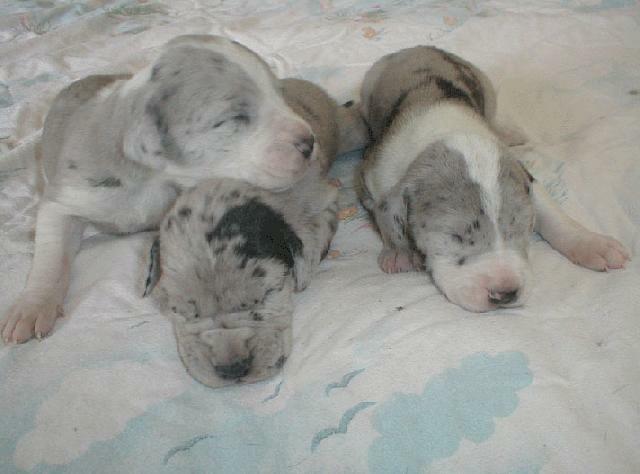 The colour called (see gallery merles) is a slant that was included within the breeding standard of Great Danes from December 20, 2012 on. Even though there were already merles in shows, they did not win any champion titles in Germany until then. In other countries like France, Lithuania and several clubs within the United States, these Great Danes sometimes were already admitted for breeding. If you think about it this really does make sense: After decades of breeding champions, the vitality of our dogs had deteriorated. 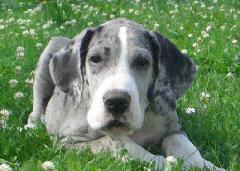 For many generations, only Great Danes champions have been paired - health and life expectancy often have been ignored. As merles were not entitled to become champions, they never had been recognized, even though they indeed could compete with their sisters and brothers. 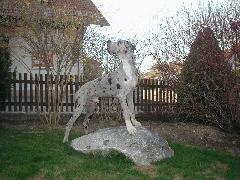 Therefore, we always pay attention to the vitality of our Great Danes, not for their titles only. At last, I would like to say, that it is impossible to eliminate the merle by breeding selection. As long as there's a breeding of harlekins, there always will be merles, too. And if you love animals, you will not buy from breeders that don't raise their merle puppies! !